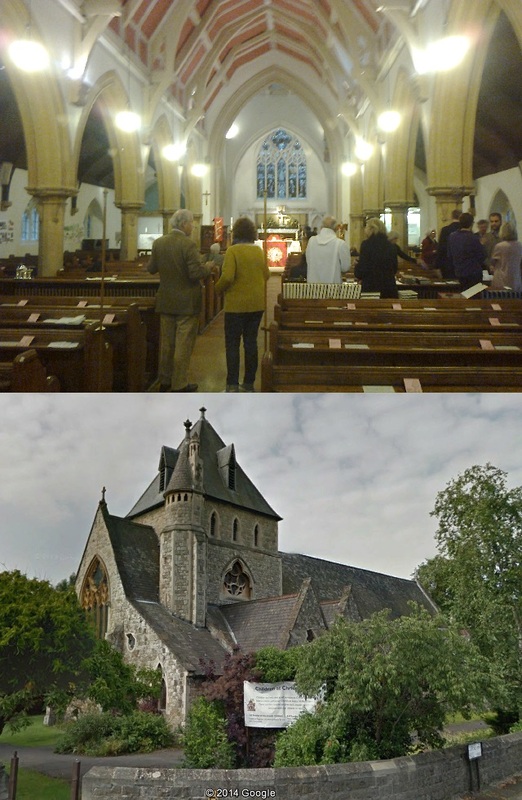 The church was founded in 1883 as a daughter church of Holy Trinity Church, another in Wimbledon. The current building was built over 1908-9, and was consecrated by the Bishop of Southwark on 25 September 1909. The church became a parish in its own right the following year, and the building has remained substantially in its original form since then. The church building is a red-brick basilica. The windows are all plain glass with the exception of the one at the front, above the altar. This shows Christ enthroned, flanked by the four patron saints of the UK (Ss George, Andrew, Patrick and David) as well as by the four animals symbolic of the Evangelists. There is a high altar directly underneath this window, but it was not used during the service. Instead, a more modern-looking table at the other end of the sanctuary was used, which has two thick purple candles and a carving of the Christian fish symbol. A pulpit – over which hangs a crucifix – is to the left of the table, but a modern unornamented lectern was used instead. On the right hand wall of the church there is another crucifix, and closer towards the back is a shelf of children’s books. There is a Lady Chapel to the right of the sanctuary, and a font at the back of the church. An icon of Saint Andrew is opposite the pulpit. The service was taken by a friendly male vicar. This was his last Sunday at the church, having been filling in for the church’s previous vicar who had recently passed away. He wore black clothes with a clerical collar, and made sure to welcome me as I arrived and also to chat to me after the service. A lady from the congregation gave the Bible reading, and another led the responsive prayers. The service I attended was on Mothering Sunday, and so the congregation was swelled somewhat by some children of a local school visiting with their parents. I counted roughly 55 adults, with 21 children. There seemed to be a good range of ages in the congregation, from teenagers and young adults to the more elderly, and the gender balance was around equal. The congregation was primarily white, with a few people of an ethnic minority. The congregation seemed very friendly, with several people welcoming me as I entered the church. I attended the 10am Sunday morning service. Usually this would have been a Parish Communion, but there was no communion today due to the focus being more on Mothering Sunday; one parishioner told me that not having communion was very unusual, and that it is normally every Sunday. The service started with the vicar welcoming everybody to the church, especially the children, and going through a verse of some of the songs (the words to which were printed on the service sheet) so we would know their tune later. Two of the schoolchildren lit four candles at the front of the church, with a prayer being said as each one was lit. Then, after a first song and some prayers, a Bible reading – Colossians 3:12-17 – was read out by a lady from the congregation. After the reading, the schoolchildren performed the first two verses of All Things Bright and Beautiful, with some of them accompanying it on recorders. The congregation then joined in for the rest of the verses. The vicar then gave a short talk to the children on the history of Mothering Sunday, after which they went to one side of the church to make posies of flowers while the vicar gave the sermon to the adults. The sermon was on the virtues of patience and compassion, linking them both to the reading and to the theme of Mothering Sunday, with the message that the love of a parent for their children can teach us both about the love of God for humanity and the love we are meant to show to everyone. The children returned with posies of flowers, which they presented to their mothers in the congregation. After another song, one of the children performed a piece of music on a guitar, after which there were prayers led by a lady from the congregation, concluded with the Lord’s Prayer led by the vicar. There was then a final song, and a concluding blessing. The service lasted about 55 minutes. Coffee, juices, biscuits and cake were available at the back of the church after the service. Most of the congregation stayed for some time for refreshments and to talk, and Happy Birthday was sung to three people whose birthday it was that week. The church was built over two years, designed by Samuel Teulon and opening in August 1859. The church hall was opened in 1936 and the current organ was bought in 1954 (but contains the pipes of the original). The church gained parochial status in 1961. The interior of the church has whitewashed walls, sandstone pillars separating the aisles from the nave, and a pastel-red ceiling. The cushioned pews face towards the stained-glass window at the front, beneath which is the high altar, decorated with a Chi-Ro and with a cross and flowers on top. There is a choir stall on each side of the sanctuary, and at the front of the nave is the main altar, with a pulpit and lectern on either side of it. Altar, lectern and pulpit all had red decorative drapes over them. At the front left of the church is a smaller altar, and at the front right the area into which the junior church went during the service. The font is in the aisle to the left of the nave, and a small crèche-like area is at the back. The service was led by a vicar in a white cassock with a red stole, who was helped by four altar-servers in white cassocks. There was also a choir of eight or so. The congregation numbered roughly ninety, although that number was probably somewhat more than usual due to there being a christening. There was a wide range of ages, with a lot of children and younger adults. There were a few from an ethnic minority, and the gender balance was about equal. The service I attended was the 10:00 am Parish Eucharist, the main Sunday service. After notices and a welcome, the service opened with a hymn. We followed an order of service which was handed to us along with a hymn book and a notice sheet. The first half of the service revolved around the christening that was taking place that morning. Before the christening came hymns, prayers, and the readings: Ephesians 1:15-23 and Matthew 25:31-46. After these came the sermon, which reflected on the similarities and differences between the Baptism of Christ and the baptism about to take place, and spoke about entering into a life in the church. The christening itself followed the standard Anglican formula, with the young child being baptised in the name of the Father, the Son, and the Holy Spirit by having water splashed onto his head from the font after his parents and godparents made promises to commit him and themselves to Christ. After the christening, the second half of the service revolved around communion. This took place after more hymns (during one of which the offering was taken) and prayers (including a modernised version of the Lord’s Prayer). Communion itself was taken with stewards going to each pew in turn and inviting those there to go up to the front, where they received the bread and wine from the vicar. After communion, the newly-baptised child was presented with a candle, and after a final hymn and a blessing the service came to an end. A junior church was held during the service; just before the first reading, the younger children went into a room adjoining the nave at the front-right corner and stayed there until just before the blessing, when they came back into the main church. Coffees and biscuits were served after the service from a table near the font. I was introduced to the vicar by one of the stewards, who welcomed me to the church. The church was founded in 1887, commissioned by the wealthy Edith Arendrup, designed by Frederick Walters, and administered by the Society of Jesus (or Jesuits). Building continued on the church until 1901. In 1990 a new altar and tiled floor were installed, and in 2013 the administration of the parish was handed over from the Jesuits to the Archdiocese of Southwark. Next door are church halls refurbished in 2008, in which various community groups are hosted. The large church is in the Gothic style, with pointed arches and pillars inside above each of which is a statue of a saint or angel. Stained glass windows display saints, martyrs, and Christ either crucified or as king of glory. Pictures of the stations of the cross adorn the side walls of the nave, to the left of which is a side-chapel dedicated to the souls of Caroline Currie and her husband, benefactors to the church who funded the construction of one of the aisles. Plaques in memory of other former parishioners are dotted around, and at the back left of the church is an ornate font behind a closed metal gate. Near to that is a large statue of Mary holding Christ, dead after the crucifixion, as well as some candles. Candles burn at the back right of the church as well, near to which is a large crucifix and stairs going up to the choir gallery. At the very front of the church is the old altar, replaced in 1990 and now used as a large tabernacle for Eucharistic reservation. In front of this is the current altar, on which two candles burn. To the left of the altar is a wooden pulpit (with a plaque next to it in memory of a priest who died while preaching from it) and to the right of the altar is a statue of the Virgin Mary. Above the sanctuary area is a large crucifix, flanked by images of Mary, St. John, and angels. The service was led by a priest in green and golden vestments, helped by three other men (probably deacons or sub-deacons of some sort) in white and red vestments. There was also a choir, although as they were situated in the upper gallery at the back of the church I was unable to see how many people it was comprised of. There was a large congregation, numbering somewhere between 110 and 120, with a mix of ages and ethnicities and a roughly equal balance between the genders. Organ music began to play about five minutes before the beginning of the service, which started with a hymn during which the priest censed a crucifix on a pole. There were then prayers of confession, followed by Gloria being sung. One of the deacons then ascended the pulpit and gave a reading from Isaiah. This was followed by Psalm 26 being used as a responsive prayer, after which the deacon gave the second reading, from 1 Corinthians. It was then time for the Gospel reading, which was done with a lot more ceremony – the priest brought a Bible up from the altar to the singing of “Alleluia” , flanked by two of the deacons holding large candlesticks and the other with an incense thurible, and read the passage from Matthew on the calling of the first disciples. The priest then gave the sermon, on the subject of making time in our lives for prayer. This was followed by the Roman Catholic version of the Nicene Creed being sung in Latin, after which there were some prayers in English, and then another prayer sung in Latin. The collection was then taken, during which time the choir sang and the priest and deacons prepared the communion bread and wine at the altar. After this, there were some more prayers, and the choir sung the Sanctus (“Holy, holy, holy Lord…”), after which there were more prayers during which the priest lifted up the wafer and wine to be used for communion, and then the Lord’s Prayer. The congregation shared the sign of peace, and after some more prayers communion was served. At the end of communion, the unused elements were placed in a tabernacle at the far end of the sanctuary, after which there were some more prayers and then some announcements. The priest then blessed the congregation and ended the service, which had lasted for roughly an hour and ten minutes. Most of the congregation left the church after the service had finished, with some staying behind in the pews to pray in silence. Unlike other churches I have been to, there did not seem to be a place where refreshments were served afterwards, although I may have simply overlooked one.